A controversial beef ban imposed in Maharashtra in early March will not hamper India’s plans to start exports of buffalo meat to Russia. Indian suppliers, including those in the state affected by the ban, are bullish on the new market despite declining meat imports in Russia. A bill banning slaughter of cattle imposed in Maharashtra earlier this month not only made lives of beef eaters in Mumbai and other cities extremely tough, but has threatened to revive old tensions between social, religious and political communities. Yet, for Russia and other countries importing Indian meat, the ban on local sales and consumption of beef in Maharashtra is not a reason to worry, Mumbai-based exporters say. As India exports buffalo meat, not beef (meat of cow and its progeny), the ban will not affect the exports. A cow is considered a sacred animal in Hinduism, which is practiced by about 80 per cent of India’s population. Beef is consumed by Christians, Muslims and other religious minorities, including those within the fold of Hinduism. Beef, irrespective of its origin, be it cow, bullock or buffalo, has always been the cheapest meat, and the only meat affordable for the poor. The Indian constitution provides states with exclusive powers to legislate the prevention of slaughter and preservation of cattle. There are only a few states, including Arunachal Pradesh, Kerala and some North-East states, with no restriction for cattle slaughter, according to Department of Animal Husbandry & Dairy of the Ministry of Agriculture. Most states ban the slaughter of cow and its progeny, including bulls and bullocks of all ages, while some allow the slaughter of cattle with restrictions like a "fit-for-slaughter" certificate issued on the bases of various factors like age and continued economic viability. Maharashtra Animal Preservation (Amendment) Bill signed by India’s President Pranab Mukherjee on March 3 has been pending for approval for last 20 years. The bill imposes Rs 10,000 (US$ 60) fine and imprisonment up to five years upon violators. Although the slaughter of cows and calves in Maharashtra as well as in most of other Indian states was banned under the Animal Preservation Act, 1976 the new bill extended the ban on slaughter to bulls and bullocks. The bill does not cover water buffaloes whose meat is considered being of inferior quality. India has been exporting buffalo meat for past four decades. Despite the beef ban being one of the most discussed issues in India for past two weeks, Russia’s veterinary regulator Rosselkhoznadzor (Federal Service for Veterinary and Phytosanitary Surveillance) claims to have no information on any beef ban from the Indian authorities. Few month back the regulator appointed an expert who conducted check-ups of conducing abattoirs and meat factories in different states. According to the regulator’s spokesperson, the export will control both production and dispatch of meat that is to be exported to Russia from four Indian companies, approved by the Russian regulator in December last year. The list of approved companies includes Maharashtra-based Frigerio Conserva Allana Limited and Frigorifico Allana Limited, both subsidiaries of Allana Group, India’s largest meat exporter, and two companies from Uttar Pradesh, Fair Expors Pvt.Ltd and Amroon Foods Pvt. Ltd. In an e-mail interview with RIR, Aaziz Latif, CEO of Allanason Pvt Ltd, said the beef ban in Maharashtra would not affect the company’s plans to export deboned and deglanded frozen buffalo meat to Russia. According to Russian Federal Customs Service (FSC), meat imports in Russia in 2014 recorded more than 1 million tonnes or US$ 4,271 million. In January and February 2015, Russia imported meat worth US$ 58 million and US$118 million respectively from non-CIS foreign countries. Beef imports accounted for US$ 17.7 million in January and US$ 50.3 million in February, more than 50 per cent drop compared to the same period in 2014. Analytical agency EMEAT estimates the imports of chilled beef to Russia (excusing the trade within customs union) stood at 2900 tonnes, frozen beef at 12,300 tonnes, beef by-products at 11,900 tonnes as on 1st March, 2015. The total import of chilled beef to Russia in January-February 2015 dropped 76,2 per cent to 900 tonnes, as compared to the same period of 2014, frozen beef imports reduced by 63,8 per cent to 15,400 tonnes and beef by-products fell 61,2 per cent to 23,900 tonnes. 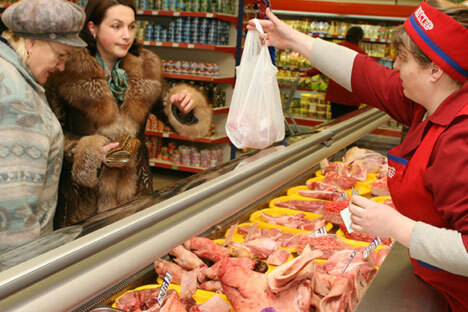 Russia has been reducing meat imports aimed at reaching meat self-sufficiency during several years. In January-February 2014, beef imports dropped 27,1% (chilled beef), 31,3% (frozen beef) ad 15,4% (be-products) as compared to the same period of 2013. Currently, the leading importer of bovine meat to Russia is Brazil. It supplied 12,200 tonnes within January-February 2015, more than 50 per cent down from the same period of 2014. According to a report by FICCI, a premier industry body in India, Indian buffalo meat is one of the largest agricultural exports (by value) in the country, after guar, rice and seafood. India has been exporting frozen buffalo meat to over 65 countries, including the Philippines, Malaysia, Brunei, Mauritius and Seychelles. Last year, according to Federation of Indian Export Organisations, India replaced Vietnam as the world’s largest supplier of buffalo meat in global markets. The buffalo meat exports have been rising by 25-40 per cent annually and are expected to reach $6 billion in 2015. Until recently, Indian buffalo meat was not present in the Russian market as a result of the ban imposed by Rosselkhoznadzor due to some phytosanitary issues. According to Latif, buffalo meat is already exported to many CIS and ex-USSR countries like Azerbaijan, Uzbekistan, Tajikistan, Kyrgyzstan, Turkmenistan, Armenia and Georgia. Sergey Yushin, head of National Meat Association of Russia (NMA), believes it is difficult to say what market share the Indian buffalo imports may gain. “This product is not yet known either to meat processing plants or to retail stores. We don’t yet know how manufacturers of cooked meats and sausages will appreciate the consumer properties of buffalo”. Experts says the competition among beef exporting countries is increasing due to a drop in the meat consumption in Russia that affects imports. He added that, according to provisional data, the prices for buffalo will not be lesser than for beef from South America; thus many importers may prefer working with trusted suppliers rather than braking networks they had been building for past many years. “There is a high level of trust between Russian importers and South American exporters while India is yet a new and unfamiliar partner. There are fears of contracts being disrupted, of possible deviations of quality and range,” he says, adding that one should not expect easy and quick gains in Russian market. Yushin points out, however, that beef tariff rate quota (TRQ) for “other countries” group (which includes India) are 418,000 tonnes, out of which frozen beef TRQ is 407,000 tonnes. “There is something to fight for,” he says.